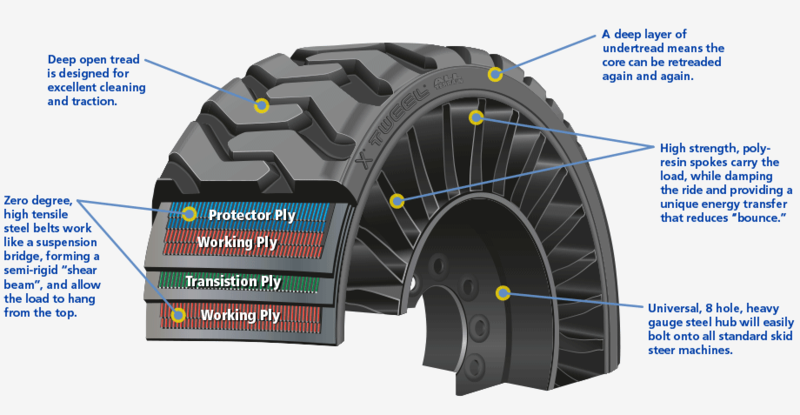 It was way back in 2005 that Michelin started showcasing and talking about their exciting Tweel concept (an airless combination of the wheel and tire). However, nothing big ever came of it. This, of course, led to years of speculation concerning the Tweel and Michelin’s production… Was the design flawed? Unsafe? Was Michelin holding back on the public in an attempt to gorge money? Well, some of these answers have finally been answered… sort of. Earlier this month, Michelin announced that they will be upgrading the production of the Tweel by dedicating an entire factory to build them. Located in Piedmont, South Carolina, the factory will open November 20th and be dedicated solely to building the Tweel for John Deere lawnmowers (these JD Tweel’s have been available for sometime, but no automotive counterparts have been produced). The design features a steel center hub that bolts up like a regular wheel, and poly-resin spikes that radiate outward to support the treads. Additionally, this airless design makes it impossible for these bad boys to go flat and also helps them mold around obstacles. But as great as all of this sounds, the public is still left wondering why in the hell Michelin hasn’t released an automobile version of these things yet? My bet: it would kill their sales, and they are not willing to give up that piece of the pie yet. Will a competitor please rise up and make these things happen?!?!?!?! This entry was posted in Culture and tagged airless tire, factory, john deere, michelin, piedmont, pneumatic, south carolina. Bookmark the permalink.